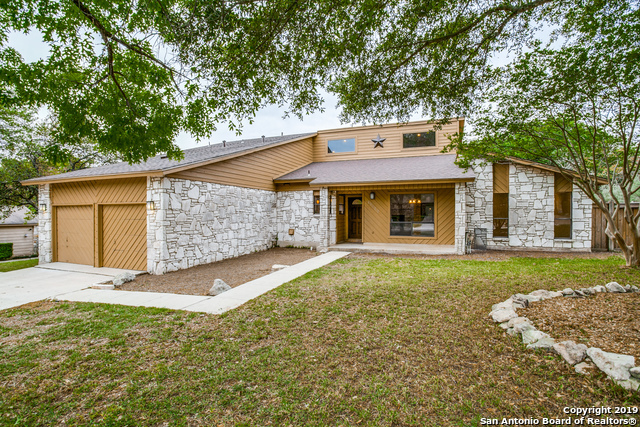 All GREEN SPRING VALLEY homes currently listed for sale in San Antonio as of 04/24/2019 are shown below. You can change the search criteria at any time by pressing the 'Change Search' button below. "Charming 4 Bedroom/2 Bath + Loft 1.5 Story Home in Desirable Green Spring Valley. Sleek Island Kitchen boasts built-in appliances, freshly painted cabinets, & custom tile backsplash. Stunning custom wood accents throughout.Soaring ceilings in HUGE family room with rock fireplace. Luxurious master suite offers laminate wood flooring & tastefully updated master bath with dbl vanities & frameless shower. 4th Bedroom + Loft Up. Amazing balcony overlooking spacious backyard with shady trees,deck,&"
"This one of a kind Santa Fe style home has stunning custom features nestled in a quiet neighborhood with mature trees and a spacious manicured yard. This home wraps around a central courtyard and features an adobe style fireplace, multiple ceiling designs including tongue & groove wood ceilings as well as an exposed beam cathedral ceilings, saltillo tile, roman tub in master and much more." "Adorable 2 story home offers 3 bedrooms & 2.5 bathrooms. Gorgeous open floor plan w/ large windows. Spacious living room w/ wood burning fireplace. Cute kitchen w/ island, granite counter tops, SS Gold series appliances & darling door that leads out in the backyard. Dining room w/ unique light fixture. Huge master suite w/ vaulted ceilings & ceiling fan. Master bath w/ walk-in shower. Roomy secondary bedrooms w/ windows perfect for natural light. Nice-sized backyard w beautiful trees. A must see"